These three companies have what it takes to win in the future. Successful growth investors tend to have systems for identifying companies with competitive advantages and market opportunities that will allow them to thrive. No one is going to have a perfect track record when it comes to predicting the future, but knowing what business characteristics and trends to look for, and selecting just a handful of big winners, can have a life-changing impact. To put readers on the track of some growth stocks with big potential, we asked a panel of top Motley Fool investors to profile a company that's positioned for continued success. Read on to see why they picked Himax Technologies (NASDAQ:HIMX), NVIDIA (NASDAQ:NVDA), and Activision Blizzard (NASDAQ:ATVI). Tim Brugger: (Himax Technologies) Last quarter, Himax reported a 10% drop in total revenue, to $197.1 million. This may have you wondering what the stock is doing on a list of growth stocks for successful investors. There are a few answers to that question that make it worth considering. The revenue decline was not a surprise given that Himax was admittedly slow in meeting customer demands for its wafer level optic (WLO) offering. In response to its WLO shortcoming, CEO Jordan Wu ramped up construction of a manufacturing facility a quarter ago to meet demand. The result was initial WLO shipments are out, and are expected to "accelerate significantly" this quarter and next year. Another component to Himax's future growth, and perhaps its most exciting, was the recent completion of its end-to-end 3D-sensing solution. Working in conjunction with Qualcomm (NASDAQ:QCOM), the Himax SLIM 3D sensor is a one-of-kind design for the world's Android smartphones. Wu said shipments of an estimated 2 million units will begin in 2018's first quarter and will ramp up from there. Year-over-year revenue did decline, but in Himax's case, monitoring the momentum its building quarter to quarter warrants a look. Given that the recent miscue of its WLO production levels are now behind it and its 3D sensors are ready for customers, Himax's sequential growth paints an impressive picture. Thanks to efforts to diversify its product mix, every segment outperformed the previous quarter, including Himax's non-display driver-division revenue soaring 85.9%, to $55 million. The future for Himax begins now, which is why it's a growth stock that successful investors should give a long look. John Rosevear (NVIDIA): I suspect that NVIDIA is probably already on a lot of successful investors' radars. But if it's not on yours, now's the time to fix that. 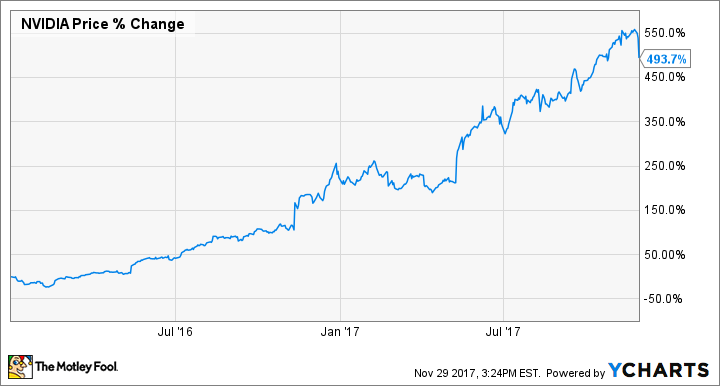 NVIDIA's stock has had quite a run over the last couple of years, but there are good reasons to believe that it's just getting started. Until recently, NVIDIA was known as the leading maker of graphics processing units, or GPU chips. These chips have long been the key to graphics-intense computing, giving machines built for tasks like video editing or serious gaming the specialized computing power they need to operate smoothly. So what? Well, it turns out that GPUs are also particularly well-suited to handle the intensive data-processing needs of artificial-intelligence (AI) applications -- and that's a market that's expected to get huge before long. Cloud computing, robotics, self-driving cars, and any other field where you hear the phrases "deep learning" or "machine learning" -- that's all AI, and those are all fields in which chips like NVIDIA's will soon be in hot demand. Of course, NVIDIA already has serious competitors in some of those fields. In self-driving cars, for instance, NVIDIA will face a serious challenge from Intel (NASDAQ:INTC) and its newly acquired Mobileye subsidiary, which has great technology and deep relationships with most of the world's automakers. It's possible that NVIDIA will have to settle for being the runner-up in that market niche. But if so, so what? Even if NVIDIA gets only a slice of the self-driving car market, when combined with slices of all of the others, its total pie has the potential to be huge -- and its growth story could be just beginning. Keith Noonan (Activision Blizzard): Video game publisher Activision Blizzard has been on a huge winning streak, and it's positioned to continue thriving thanks to a range of competitive advantages and industry tailwinds. The games market is on track for long-term expansion, with engagement in America and other leading markets at record levels, and growth for in-game purchases pushing profits higher. Emerging opportunities in markets like China and India could provide major momentum further down the line. Digital downloads will continue to make up a greater percentage of unit sales, lifting margins along the way, and emerging categories like mixed reality and esports have the potential to elevate video games to new levels of popularity. No video game publisher is better equipped to benefit from these trends than Activision Blizzard. The company boasts the strongest franchise portfolio of any third-party publisher, and its proven assortment of development studios has built a presence that's unrivaled across the console, PC, and mobile platforms. It's also building a media empire that expands beyond games, with plans to bring its major game series to life in film and television productions, and a major merchandising push that's just ramping up. Activision Blizzard has already been a big winner over the last five years, with shares up roughly 440% over the stretch, but the company appears to be on track to continue delivering market-beating returns for shareholders.